Last week we attended a public involvement conference organised by INVOLVE. INVOLVE was originally set up by the Department of Health in 1996. It remains one of the oldest Public and Patient Involvement (PPI) organisations in the world. We had a stand promoting our own work championing expertise from experience in mental health research. We also produced a poster that was on display and spoke within a workshop session on co-production. So it was a busy day! It was also really enjoyable and very interesting. Having the chance to meet researchers from diverse areas of health research is unusual. I was in a workshop and the woman next to me asked “do you work with rare diseases?” Another person visiting our stand spoke about dentistry research engaging kids in her school. I think that is called “science capital”, a concept introduced in one presentation which was new to me, but is about helping us to understand why some people engage in science and others do not. 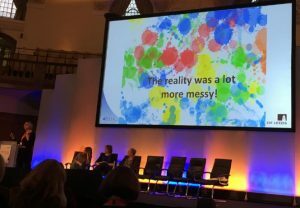 Another reason the conference was so valuable was finding out about the new ways that people are using to involve and engage people in research. Talks from two Wellcome Trust public engagement fellows set the scene as well as sessions covering addiction research, invisible illnesses and being a lay applicant. One of these Fellows is Delia Muir who is based in the Leeds Clinical Trials Unit and a performing arts specialist. Her blog is titled Performing Health. Delia is passionate about improving patient and public involvement in research, and she has been using creative arts-based methods to work with people with dementia and their families to tell their story and use these in performances to educate others. We also heard from a team using Reform Radio as a platform to encourage young people living in challenging circumstances around Manchester to become more interested in science. Both of these talks highlighted several key points: the importance of facilitation expertise in being able to engage the public in their work, as well as how vital strong relationships are between academic partners, creating healthy learning environments, and the ability to work with chaos and the unpredictable. Public involvement work usually means approaches have to be flexible in order to create conditions that are inclusive and respectful of all contributions. Talking to others at the conference, and thinking about my own experience in large multi-site research projects, I do think facilitation is an undervalued skill in our field. I have also started to think about what other key skills are taken for granted within public involvement. Things like mediation and negotiation skills, being a ‘critical friend’ whilst maintain strong and respectful relationships and creative methods. In one study, our lived experience advisory panel created collages to describe our interests in mental health research and the feedback was so positive because for a change it wasn’t flip charts and meeting papers! In our talk, exploring the differences between co-production and patient and public involvement activities we spoke about how moving furniture was a key part of public involvement. It might seem trivial, it takes time and effort to do, but from experience ergonomics is so important. You have to break down barriers – both physical and psychological – between academic, clinical and experiential expertise, opening up traditional silos to encourage collaboration. 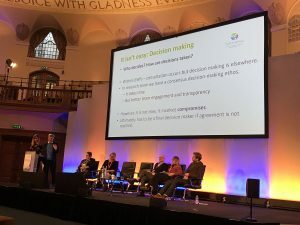 The term engagement specialists was mentioned; I do think we need more people whose expertise is public involvement work and for those skills to be valued within universities and other learning institutions. We would be keen to hear what you think are important skills and ways of working to improve public involvement in research. Do get in touch. John Gibson and I were really pleased with the Twitter conversation that developed during our conference talk (you can find us on Twitter using the handle @McPinFoundation). This is a new phenomenon, the in the moment virtual conversations ongoing in the audience, and well beyond, while you are mid-sentence! 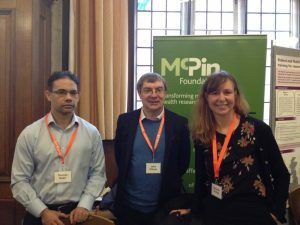 At McPin we are really keen to progress our thinking around co-production and PPI, and we found lots of other people are as well which is very heartening. Finally, the conference was closed with a farewell to the outgoing chair of 6 years – Simon Dengri. We were touched by his acknowledgement of how so many people had helped inspire him along the way, including a dear friend of McPin – the late Ruth Chandler. We look forward to more poems and blogs from Simon, and wish Tina Coldham all the best as she leads INVOLVE as the new chair of its Advisory Group.